Above, Hillary Clinton heckled on climate at a New Hampshire town meeting. She apparently sees the utility of moving strongly on climate change now, while GOP candidates are hopelessly mired in the troglodyte dynamics of their primary process. As 2015 develops into another record temperature year, the real heat will be on candidates who have no clue, much less program, on climate. AMES, Iowa— Hillary Clinton on Sunday offered a preview of her plans to combat climate change, pledging to set high goals and build a clean-energy economy. At an organizing event in Iowa, Mrs. Clinton swiped at Republicans who question the threat posed by climate change and said she was serious about addressing the issue. The Clinton campaign is expected to release more details about her climate policy Sunday evening, and she will deliver a speech about her plan Monday morning in Des Moines. Mrs. Clinton has previously characterized climate change as an urgent threat and has voiced support for President Barack Obama’s executive actions to limit carbon pollution. She has stayed silent, though, on the question of whether the Keystone XL pipeline should be built, declining to weigh in on what has been a contentious yearslong debate. Mrs. Clinton oversaw the Obama administration’s review of the project during her tenure as secretary of state. She made no mention of Keystone on Sunday but called for an emphasis on generating more wind and solar energy. Mrs. Clinton called for a rebalancing of tax incentives, which she said are too heavily weighted toward fossil fuels. “Our politics are imprisoned by the past,” she said. Democratic presidential candidates Martin O’Malley and Bernie Sanders have been unequivocal in their opposition to Keystone and have made climate policy a central component of their campaigns. Still waiting for details which are supposed to appear any time now on the Clinton website. The ever-reliable Peter Hadfield is at it again. Glaciologist and Dark Snow Project Chief Scientist Jason Box was recently featured prominently in a story about climate scientists coming to grips with the implications of their work. That story, and others, have lead some to draw the conclusion that Dr. Box’s views on coming climate impacts and sea level are extreme or on the high end, or that he views our situation as hopeless. 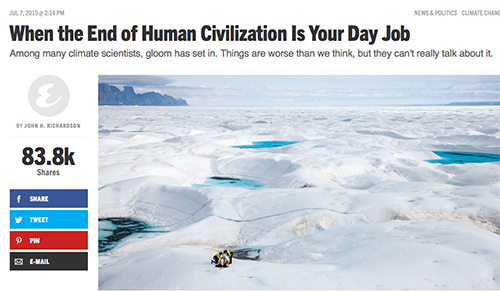 Where a lot of journalists read the “f’d”, but forgot the “if” – as Jason explains. I’m glad he took the time to set some of those notions straight in the video above. As so often happens, Bill Maher’s set-up question kind of muddies the issue. You can hear the exchange which starts at 1:54. Sensors in Earth orbit give us the capability to monitor vast areas, daily, in near real-time. As part of the Dark Snow Project, I’ve been working with daily NASA MODIS MOD14A1 data to map the occurrence of fire activity. The map below illustrates the single most active day so far in 2015 for North America with fires ravaging central western Canada and interior Alaska. 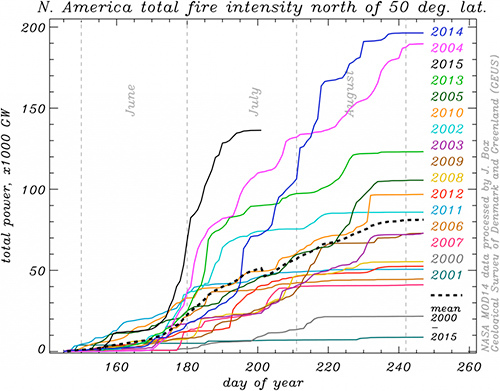 Through 18 July, 2015, these data indicate the cumulative radiative power of North American fires to be the highest on record in the period of observations beginning in 2000. For July, 2015 fire power is 2.5 times the sixteen summer average 2000-2015. More at the Dark Snow Link. 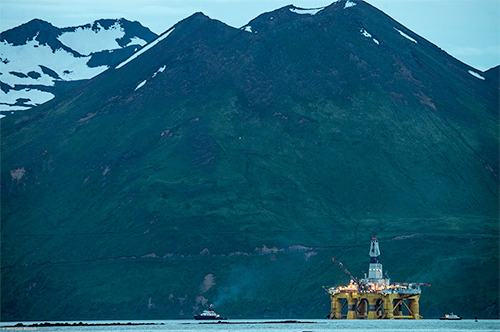 Shell Drilling in Arctic – Less than it Seems? Shell Oil’s recently approved arctic drilling project, although a source of great rancor for both oil industry partisans and environmentalists, may be less than meets the eye. One more reason to consider that the Obama administration, choosing its battles carefully, may have chosen to go ahead and let Shell beat its brains out one more time. Shell is set to launch a new round of Arctic drilling within days, after receiving critical federal permits that could force the company to halt work thousands of feet above potential oil deposits. Under the limited Interior Department drilling permits, Shell can only focus on one well at a time, and it cannot penetrate potential oil- and gas-bearing zones some 8,000 feet underground, at least until a damaged company-contracted icebreaker returns from repairs in Oregon. That ship, the MSV Fennica, is meant to keep ice from encroaching on Shell’s drilling operations and is designed to install critical equipment on top of a damaged well in an emergency. Federal regulators insist that emergency capping stack must be on hand and ready to deploy within 24 hours of an incident. But they decided to follow the same approach used during Shell’s last attempt at Arctic exploration in 2012 when other emergency equipment was unavailable, by allowing initial top hole drilling only. Three years ago, that meant Shell’s wells stopped about 1,300 feet down. The permits illustrate again the Obama administration’s struggle to balance oil and gas development on land and at sea with a green agenda, including strengthening environmental protections and combating climate change.